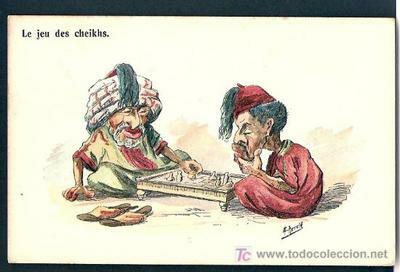 The Aliyats (players of Shatranj - chess among the Arabs - of first category) were shocked. An unknown player had come to the court of the Emir Abdul Gualid Al Bhujarat Al Murat and threatened to disturb the peace of the small principality where all of them, Aliyats and not so Aliyats, could live so comfortably, because of the sickly passion of Al Murat by Shatranj. Everything had been fine for a long time, until this unknown man who had made Al Murat believe that he was invincible in Shatranj and had given proof of it defeating Al Murat himself - as if that were something very difficult - and a few players of second and third strength who were that day on the Diwan (the Council room) entertaining the Emir. The unknown Aliyat had beaten them all and had even defeated a pair of dogs (players with no preparation or knowledge, even without real interest in Shatranj) and had given evidence of sufficiency, advising them and forgiving some of their mistakes with a benevolent attitude. Al Murat was fascinated and began to play game after game with the stranger. He did him the honor of losing them all, and after the session at the Diwan Al Murat stood up and solemnly declared that if one of his own players did not show his own ability to defeat the newcomer, he, the Emir, would not only give the newcomer his preference, but also a few heads of the useless men he had beaten would roll by the floor. With that said, the Aliyats were disconsolate, extremely worried and afflicted and sought a solution. They had studied the style of play Shatranj of the newcomer Aliyat and found that he was an eminently defensive player, who never hurried and whose victories depended on a tenacious defense. The Aliyat himself had declared that he did not need to do anything, everything his rivals did, that by careless or arrogance, they ended up defeated. He had defined himself as a defender and had disdainfully declared that no attack would prosper against him, because he would resist them all. The Aliyats remembered that in their time of lost splendor they had had their own champion, the one who had never been defeated, the one whose attacks were always victorious, the infallible Al Ma'mun Al Benengel. But Al Ma'mun was retired years ago and had never wanted to play again after his retirement, and less against Al Murat, whom he considered a half-witted, apt only for ball games or club, but not for Shatranj. The Aliyats went to look for him and explained him the situation. They played against him and Al Ma'mun defeated them all impeccably, as in the old days. They begged him to help them, they explained to him that the peace of the principality might be at stake, since much was owed to the Shatranj, the Emir's favorite game; and now this intruder, this stranger, came to disturb everything with his invincible defenses and his methodical and imperturbable character. That is why they, in a humble act that honored them, had thought that he, Al Ma'mun, he of the ever victorious attacks, could face the new Aliyat, the one whose defenses were always perfect and impregnable. Al Ma'mun Al Benengel listened to them in silence, his eyes sparkled with malice twice and then he declared that he would help them, but that he had some doubts as to what would happen. Doubts, what doubts could have the best of Aliyats of all time, the one whose attacks were always victorious? He said, "What will in the world happen, if a player whose technique of attack is infallible confronts somebody whose defense is always effective and can never be defeated?" No one knew what to answer. "Indeed", continued Al Ma'mun, "if my attack always wins and his defense never loses, then, what?" They all looked at each other in amazement and silence. "If my attack", insisted even Al Ma'mun, "can’t be rejected and his defense can’t be forced, what will happen with our game, because ..."
They did not let him continue, Whatever happened, it was necessary to act fast, the actual circumstances demand it so. In fact, everyone had understood, but it was late to get lost in these ramblings. Either it was false that Al Ma'mun had an attack always victorious or it was false that the new Aliyat could always defend himself effectively. If both assertions were false, they would have to rely on Al Ma'mun's expertise and if both were true, only Allah knew what could happen. They arrived to the Diwan with their faces twitched. Al Murat was surprised when he saw that old man he did not know, but when they told him who he was, he was enthusiastic about the news and he announced the imminent confrontation between the two invincibles. There was forced silence and the two Aliyats began to play. The attack of Al Ma'mun Al Benengel was impeccable and developed effectively, but without haste. Everyone at the Diwan, Al Murat, players of all strengths and mere inquisitive people, were convinced, after every move made by Al Ma'mun, that his victory would be inevitable in a few moves later. But, when the unknown Aliyat responded, it seemed that his position was invulnerable and no force on earth could break down his magnificent defense. Thus the moves followed, one after another, for a no-ending time . Suddenly, without being able to tell who had the turn to move, both Aliyats stood still and stared at each other in a perfect silence, without making any further moves and while everyone present looked at each other, without uttering a word, caught up by an intense emotion. When the call to prayer was made, they all left the court immediately. Just when they returned they realized that among them weren't neither the Emir nor the two Aliyats. The first to enter the room of the Council were mute with surprise until the silence was broken by a bustling gibberish, where everyone gesticulated and ripped their clothes, proving that they were at the limit of what was endurable for a human heart and leaving clear that this day had concentrated too many emotions together, so that it would be remembered for a long time as the Day Father of all misfortunes and Grandfather of misery and disgrace; Brother of pain and sorrow and Son of unfathomable fate, which is written in the book of him who never sleeps. The scene could make the hair stand on end to most courageous from the servants of Allah. The Shatranj board on which the game was being played was broken in the middle, with a long cleft dividing it into two halves; the chess pieces, lying on the ground in a chaotic situation; Al Murat lay dead in his chair, with his throat cut off and a sight of astonishment in his unnaturally wide eyes; the aliyats weren’t there and never were found. A long time later, when another Emir ruled the small principality, those ones with good memories referred to this story with reservations, and were barely able to remember the name of Al Ma'mun, without ever having known the name of his opponent. The most skeptical seriously questioned their mere existence and interpreted the facts according to the conveniences of the moment, without the Shatranj being of the slightest importance, and no one who was in his five senses, was interested in believing that such a vulgar game, which was played in the taverns and souks of all the cities of the Umma, could have to do with a plot or a story of crimes. Join in and write your own page! It's easy to do. How? Simply click here to return to Shatranj in the Arabian Desert.